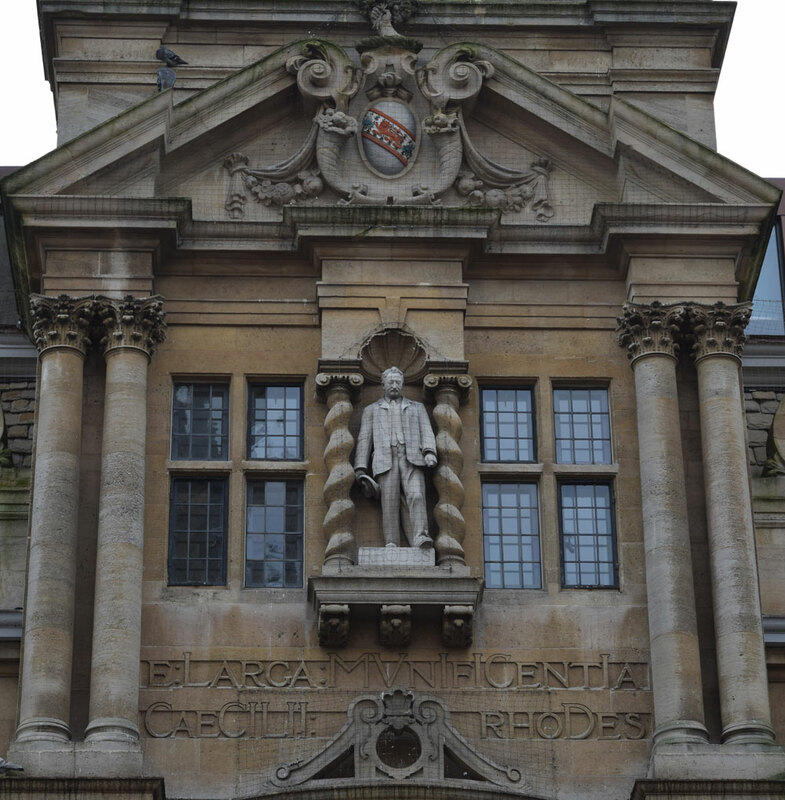 This inscription to Cecil Rhodes (1853–1902), who left £100,000 to the college in his will, is on the front of Oriel College’s Rhodes Building, facing Oxford's High Street. “The future of the statue raises complex issues, which cannot be resolved quickly. In the absence of any context or explanation, it can be seen as an uncritical celebration of a controversial figure, and the colonialism and the oppression of black communities he represents: a serious issue in a College and University with a diverse and international mix of students and staff, and which aims to be a welcoming academic community. Any changes to the building – including the addition of a permanent information board to explain the history and context, removal or replacement of the statue, or the commissioning of new works of art – would require planning consent. 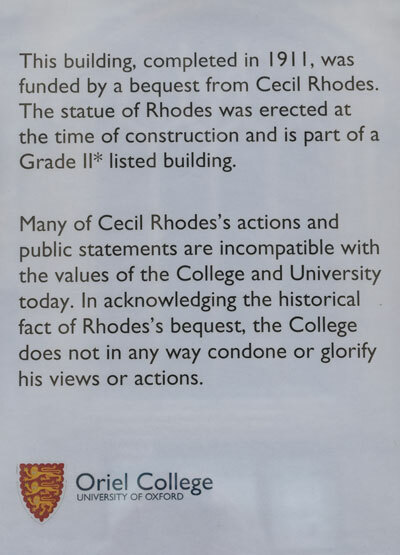 The statue, and the building on which it stands, is Grade II* listed, and has been identified by Historic England as being of particular historical interest, in part precisely because of the controversy which surrounds Rhodes. “In view of these complexities, the College has decided to launch a structured six-month listening exercise on the statue, running from early February 2016, seeking the views and ideas of students and staff of the College and the wider University, alumni, heritage bodies, Oxford City Council, residents of Oxford, and other members of the public, as we seek a positive way forward. This is a commitment to seek views in as inclusive a way as possible on how controversial associations and bequests, including that of Rhodes to Oriel, and the record of them in the built environment, can be dealt with appropriately.